A common issue that comes up in landlord-tenant disputes involves pets in rentals. We’ve previously discussed what minimum requirements laws such as the Americans with Disabilities Act generally cover, however, we have not gone into depth on what, exactly, this means, especially for landlords with a no-pet policy who are specifically approached about an emotional support or service animal. What does “reasonable accommodation” mean, exactly? According to federal agencies, it covers an adjustment, change, or exception that may allow someone with a disability with the opportunity to “use and enjoy a dwelling… including a common space.” This includes reasonable accommodations “for service animals” specifically. 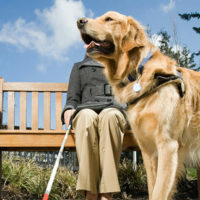 Seizure alert dogs, which not only covers dogs that are trained to respond if someone goes into a seizure, but can detect when individuals with diabetes, for example, might be suffering from low blood sugar and could go into a seizure. If you are a landlord, keep in mind that you are prohibited from asking specific questions about someone’s disability while seeking to make accommodations for their service animal—for example, asking to see proof of the disability via medical records. So what are you allowed to ask, as a landlord? Your questions are limited to a) whether or that the individual’s animal is, in fact, a service animal, and, b) if so, what type of service the animal provides. However, keep in mind that the same policy does not apply to emotional support animals: Because these animals are not covered under the Americans with Disabilities Act and are not officially service animals, landlords are allowed to ask for a doctor’s note attesting to the fact that the animal is necessary for the individual’s emotional support. If you are landlord or tenant in Florida and have any questions as to what is and is not legal, contact our experienced Florida landlord-tenant attorneys at Moran, Sanchy & Associates today to find out how we can help. © 2017 - 2019 Moran, Sanchy & Associates. All rights reserved.